Frozen beneath a region of cracked and pitted plains on Mars lies about as much water as what's in Lake Superior, largest of the Great Lakes, a team of scientists led by The University of Texas at Austin has determined using data from NASA's Mars Reconnaissance Orbiter. Scientists examined part of Mars' Utopia Planitia region, in the mid-northern latitudes, with the orbiter's ground-penetrating Shallow Radar (SHARAD) instrument. Analyses of data from more than 600 overhead passes revealed a deposit more extensive in area than the state of New Mexico. The deposit ranges in thickness from about 260 feet to about 560 feet, with a composition that's 50 to 85 percent water ice, mixed with dust or larger rocky particles. At the latitude of this deposit—about halfway from the equator to the pole—water ice cannot persist on the surface of Mars today. It turns into water vapor in the planet's thin, dry atmosphere. The Utopia deposit is shielded from the atmosphere by a soil covering estimated to be about 3 to 33 feet thick. "This deposit probably formed as snowfall accumulating into an ice sheet mixed with dust during a period in Mars history when the planet's axis was more tilted than it is today," said Cassie Stuurman of the University of Texas Institute for Geophysics, a unit of the Jackson School of Geosciences. She is the lead author of a report in the journal Geophysical Research Letters. The name Utopia Planitia translates loosely as the "plains of paradise." The newly surveyed ice deposit spans latitudes from 39 to 49 degrees within the plains. It represents less than 1 percent of all known water ice on Mars, but it more than doubles the volume of thick, buried ice sheets known in the northern plains. Ice deposits close to the surface are being considered as a resource for astronauts. "This deposit is probably more accessible than most water ice on Mars, because it is at a relatively low latitude and it lies in a flat, smooth area where landing a spacecraft would be easier than at some of the other areas with buried ice," said Jack Holt, a research professor at the University of Texas Institute for Geophysics, and a co-author of the Utopia paper who is a SHARAD co-investigator and has previously used radar to study Martian ice in buried glaciers and the polar caps. The Utopian water is all frozen now. If there were a melted layer—which would be significant for the possibility of life on Mars—it would have been evident in the radar scans. However, some melting can't be ruled out during different climate conditions when the planet's axis was more tilted. "Where water ice has been around for a long time, we just don't know whether there could have been enough liquid water at some point for supporting microbial life," Holt said. Utopia Planitia is a basin with a diameter of about 2,050 miles, resulting from a major impact early in Mars' history and subsequently filled. NASA sent the Viking 2 Lander to a site near the center of Utopia in 1976. The portion examined by Stuurman and colleagues lies southwest of that long-silent lander. Use of the Italian-built SHARAD instrument for examining part of Utopia Planitia was prompted by Gordon Osinski at Western University in Ontario, Canada, a co-author of the study. For many years, he and other researchers have been intrigued by ground-surface patterns there such as polygonal cracking and rimless pits called scalloped depressions—"like someone took an ice cream scoop to the ground," said Stuurman, who started this project while a student at Western. "It's important to expand what we know about the distribution and quantity of Martian water," said Mars Reconnaissance Orbiter Deputy Project Scientist Leslie Tamppari of NASA's Jet Propulsion Laboratory in Pasadena, California. 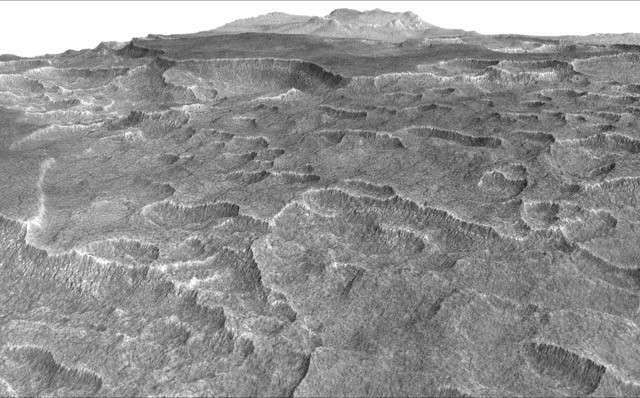 "We know early Mars had enough liquid water on the surface for rivers and lakes. Where did it go? Much of it left the planet from the top of the atmosphere. Other missions have been examining that process. But there's also a large quantity that is now underground ice, and we want to keep learning more about that." "The ice deposits in Utopia Planitia aren't just an exploration resource. They're also one of the most accessible climate change records on Mars," he said. "We don't understand fully why ice has built up in some areas of the Martian surface and not in others. Sampling and using this ice with a future mission could help keep astronauts alive, while also helping them unlock the secrets of Martian ice ages." The original version of this release was posted on the NASA Jet Propulsion Laboratory home page. Glaciers move in part because the weight of the ice causes melt water to form where it contacts the ground, due to the pressure. This very thin layer of liquid water lubricates the contact surface and facilitates movement due to gravity. If this thick ice deposit has a similar effect, then there should be a very thin layer of liquid water where it contacts the ground underneath it. If there was once microbial life on Mars, it could still be living in this thin liquid layer. The floor of a frozen pond is liquid water at 4°C, at which temperature water is at its densest. The discovery of an ice field on Mars must naturally predispose the presence of liquid water at some depth. "It's important to expand what we know about the distribution and quantity of Martian water," .. "We know early Mars had enough liquid water on the surface for rivers and lakes." "Knowledge" without evidence. All the evidence does not allow talk about water. Although we have probes and robots on Mars, the rhetoric is the same as the channels on Mars. Hotheads despite evidence they ran for fiction. As opposed to people who just run off at the mouth without having the faintest clue about what they are talking about. So why do you say this is not evidence? Ms. Cassie Stuurman is doing its job, but the results has set within the fallacy instead the actual situation on Mars. You would also be wise to learn something about the technology of the SHARD instrument which can not be fooled in the way you suggest. You are right as well as for existence of oil on Titan. There has lasted 20 years while is not probe found the desert and fiction turned into smoke. Boiling point 99.98 ° C; 211.96 ° F; 373.13 K, etc. The conclusions from this, pupils work in the primary school. It seems that, you physics bypassed in a wide arc. SCIENTISTS claimed that Titan had more hydrocarbons ( mostly methane, ethane and tholins) than all the oil on earth. It was PSEUDOscientists that interpreted this as oil on the surface of Titan (there are more than one type of hydrocarbon in case you were not aware). In future you should check your references more carefully and also give them when you make claims so that they can be scrutinized. I see no point in the rest of the your post. Whys:"This very thin layer of liquid water lubricates the contact surface and facilitates movement due to gravity. If this thick ice deposit has a similar effect, then there should be a very thin layer of liquid water where it contacts the ground underneath it." This thick ice deposit does not have a similar effect. The thin melt layer in terrestrial glaciers is a result of a gradient, and the work being done at ice/substrate interface. This combined ice/dust deposit is at rest. Glacier dynamics do not apply. baudrunner:"The floor of a frozen pond is liquid water at 4°C, at which temperature water is at its densest. The discovery of an ice field on Mars must naturally predispose the presence of liquid water at some depth." A pond can freeze solid, with all the ice at a far lower temperature than 4C. There is no natural "predisposition for liquid water at some depth" without supporting factors. From what at you produces water? On Mars has 0.146% oxygen without hydrogen. Internal Structure and Surface geology of Mars also no mention of oxygen and hydrogen. First, there should be an atoms of water that we might had water. Mr duckass is being intentionally stupid. Trolls often do this for attention. What other explanation is there? At this high dust/dirt/rock mix we're not talking glaciers. More like frozen soil. Methane = CH4 and Formaldehyde = CH20 is also present in the atmosphere and most likely originates from all over the planet.. Please link where I can learn how from CO2, CH4 and CH2O on planets formed water (maybe on Venus)? Especially how, for traces of these compounds arising large and deep lakes water (which are comparable with the overall atmosphere). The intention is only to point out the nonsense that are published (as a top science!). What are you talking about? The early solar system would have had loads of icy bodies. Plenty of them would have delivered water to Mars, as well as Earth. Mars likely formed from material that included hydrated minerals. Volcanism will get that water into the atmosphere. Why would it need to 'form' from gases in the atmosphere? Dumb. Please link where I can learn how from CO2, CH4 and CH2O on planets formed water (maybe on Venus)? Aside from the fact you seem to misunderstand what's being said in the first place, do you honestly think we believe that you'd actually open the link much less read and try to comprehend it? My apologies for my style in the comments which is provocation and satire. However think you know on what I point. Always l respect the participants in the dispute, regardless of the content and intentions. Earlier, I pointed out that my comments I send mainly to the authors of articles but I'm glad if others Include. Please only you do not pay attention to my comments because I do not write praises already a different approach along the existing evidence.